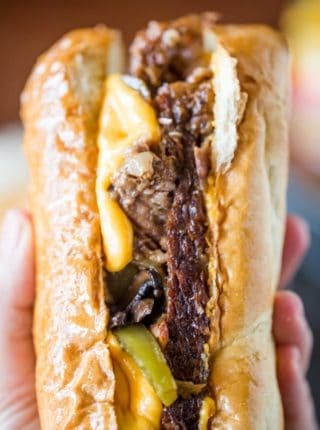 Slow Cooker Beer Braised Beef Dip Sandwiches cooked to medium doneness with a delicious beer jus in just two hours. 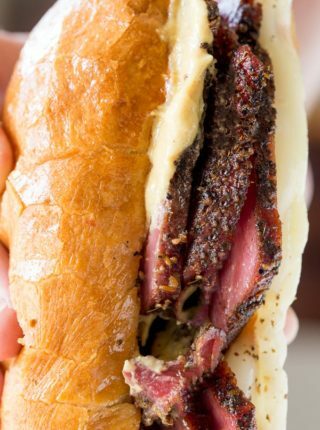 The perfect, easy, sandwiches for a crowd without heating up the kitchen or grill! 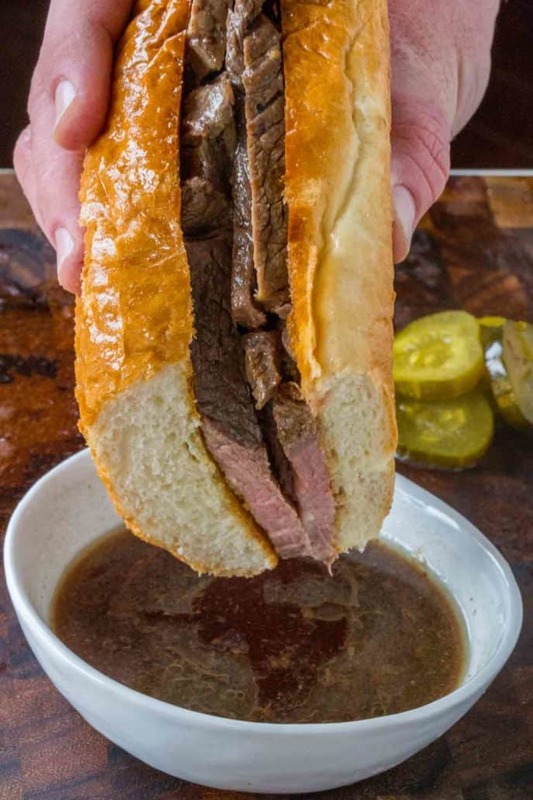 Ultimate Slow Cooker French Dip Sandwiches are a fan favorite around here, and with good reason, but those sandwiches are cooked to a fall apart doneness and these Beer Braised Beef Dip Sandwiches are sliceable and tender! It’s summer, I know. And the last thing you probably want to think about is your slow cooker. But let me tell you why this genius appliance is your friend. First of all, it’s hot out and I’m not a huge fan of making the room or my surroundings any hotter. So turning on the oven is not something I look to do. Second, this takes hardly any time at all because it cooks in just two hours. It also feeds a crowd of people so you can either make it for parties or save leftovers for lunch sandwiches (if saving for leftovers, slice really thinly so it stays tender and easy to eat). This recipe is a take on the Slow Cooker Roast Beef (Sliceable!) 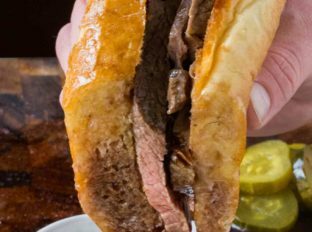 that we enjoy on a monthly basis because it’s just so easy we use it for all recipes that require steak. 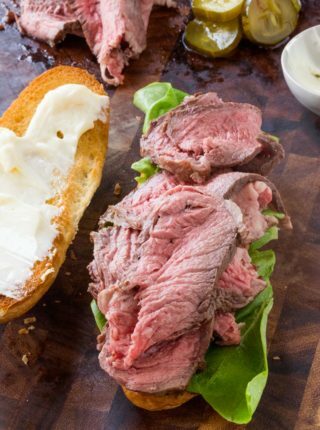 This beef is also perfect used for other recipes if you prefer not to enjoy it as a sandwich. Cut into bite sized chunks and top baked potatoes or mashed potatoes. Top your favorite salads with thinly sliced pieces of braised beef. Serve over rice with your favorite sauce and steamed vegetables if you’re looking to be healthy. Prefer to skip the beer? Substitute with beef broth and double the Worcestershire sauce. 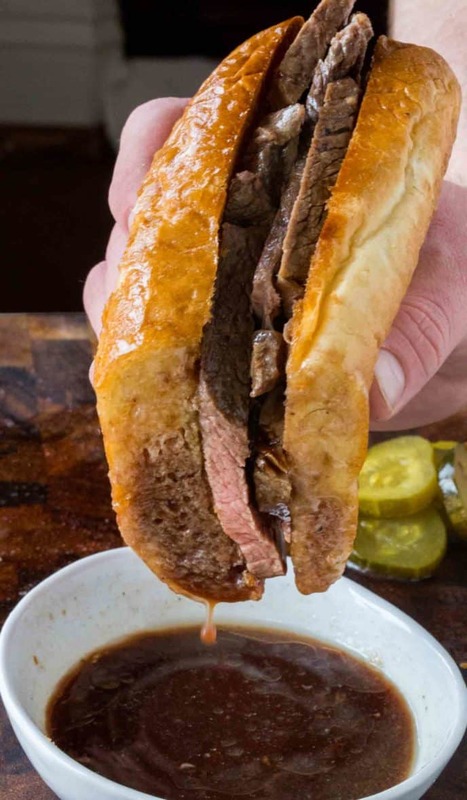 Or you can add beef broth and your favorite sauce like teriyaki or bbq sauce for another flavor. The cooking method stays the same! Important note, do not try to GUESS when the meat is done. Using a thermometer is important to ensuring the beef doesn’t overcook. If you are very well versed in cooking beef you can test by pressing on the beef to test for doneness. 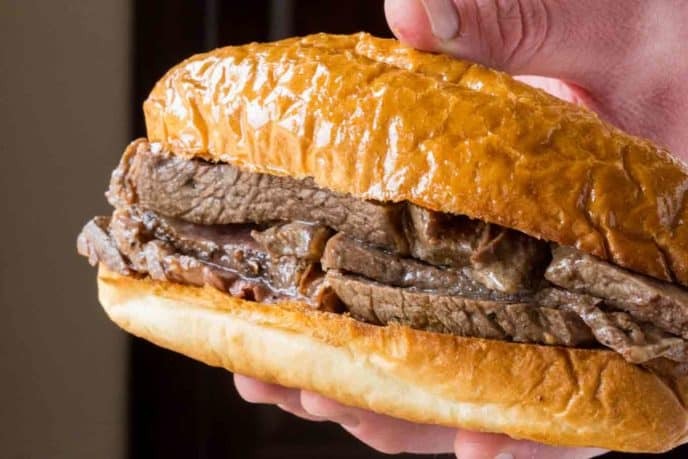 How to tell beef doneness by touch? Slow Cooker with Thermometer Probe: This slow cooker is a new addition to our house but it is an amazing new toy I’ve been having fun with. The thermometer fits through the lid without letting the heat escape. Thermometer: If you don’t have that slow cooker, this thermometer can stay in the slow cooker with no issues. 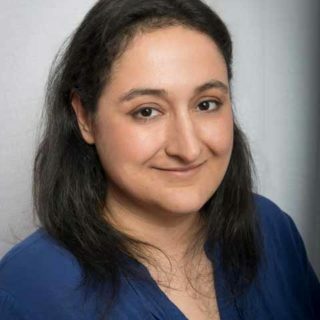 Skinnytaste Fast and Slow: An amazing book by an even more amazing blogger. Her food doesn’t taste like it lost flavor to be better for you. Rub the chuck roast with the salt and pepper. Heat up your slow cooker insert (if cast aluminum) or a large cast iron skillet on high heat with the canola oil. Sear the beef on each side for 3-4 minutes until it is a good golden brown (the beef will not get any more color in the slow cooker). Layer the onions onto the bottom of the slow cooker. Put the beef and the drippings from the pan into your slow cooker. Add the Worcestershire Sauce and beer. Using a standard meat thermometer or a slow cooker with a thermometer probe, cook to 135 (medium rare) or 140 (medium) degrees. 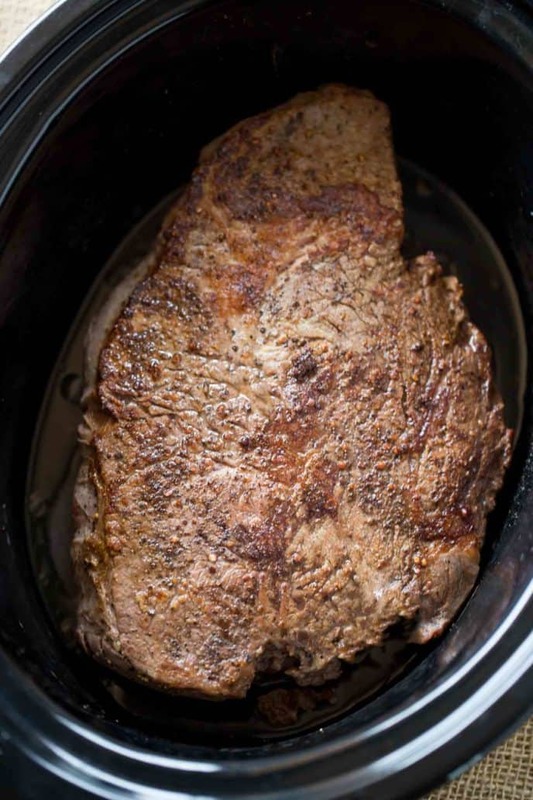 Remove the beef from the slow cooker and let rest 10 minutes before slicing. Spread the hoagie rolls with the butter and toast until lightly browned. Layer with the sliced beef and dip in the drippings (strain out the onions). Opps, so sorry about that. You’ll want to add the beer after you put the beef back into the slow cooker. I updated the recipe card to show the correct steps. Thanks for catching that! Sounds great, but when do you add the beer? Sorry about that! I edited to show correctly now. You’ll want to add it into the slow cooker after putting the beef back in. Unless I’m missing something I don’t see directions for using the beer and other ingredients. Oh this looks so tasty! I love that it is made in a slow cooker! Thanks Krista! I love my slow cookers!! Where do I go to see instruction on how to make it and ingredients? I have been having a hard time thinking of new things to fix for dinner. This is exactly what I have been looking for! My family will love this! Glad to give you inspiration! Looks so good! Loved that it’s made in the slow cooker! 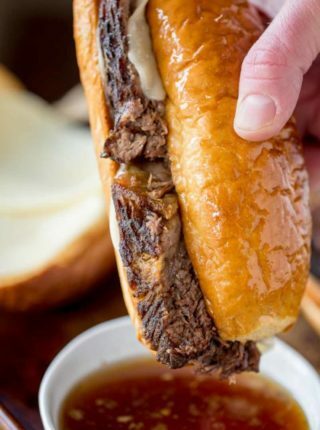 Slow Cooker Beer Braised Beef Dip Sandwiches are a great easy go to for summer. So many options for serving this! This would be such a great thing to make on Sunday and then get a few meals out of during the week! 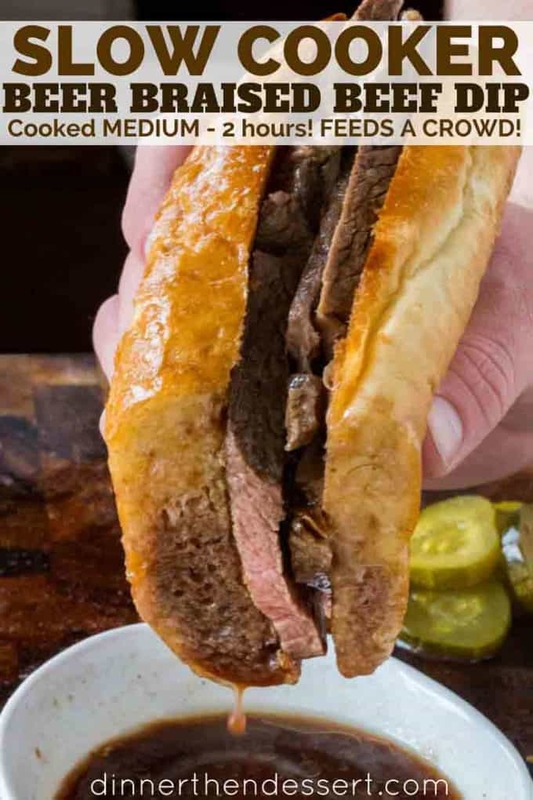 That is one amazing looking sandwich! Time to break out the slow cooker…my boys will love this! It’s such a great family friendly recipe! Enjoy! !